Major Italian oil company Eni has had overall investments of $13 billion in Egypt since 2015, the CEO of the company Claudio Descalzi told Egypt’s President Abdel-Fattah El-Sisi in a meeting in Cairo. In an official statement, Egyptian presidency spokesman Bassam Rady said that Descalzi told El-Sisi about the company’s plan to increase investments in the coming period. 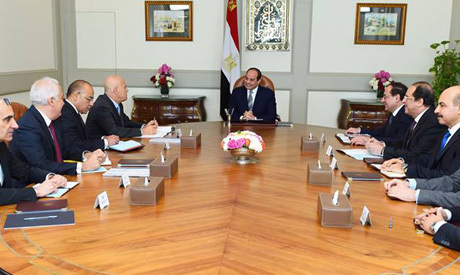 The meeting was attended by Egyptian Minister of Petroleum Tarek El-Molla and intelligence chief Abbas Kamel. El-Sisi praised Eni’s efforts in contributing to the optimisation of Egypt’s resources in natural gas, praising Egypt’s cooperation and partnership with Italy. During the meeting, Eni’s CEO said that production from the giant Mediterranean gas field Zohr, which was discovered in 2015, is moving in accordance with the set timeframe. The mammoth discovery, estimated to hold about 30 trillion cubic feet of gas, has raised interest in gas exploration in Egypt. In 2018, Egypt said it achieved self-sufficiency in natural gas consumption in September due to the gradual increase in local production and the plan to develop major gas fields in the Mediterranean. Egypt aims to become a regional gas hub, with announced plans to start exporting gas in 2019 through output from other newly discovered gas fields.